August 8, 2016 9-11PM Eastern, 8-10 Central, 7-9 Mountain, 6-8 Pacific::: Call in: (267) 521-0167. A writer, musician, and Big Pharma whistleblower, John has been psychiatrically confined for nearly 7 years with little hope of ever being released, despite years of litigation, talented attorneys, rallies, and the exposure of the apparent perjury of the assistant prosecuting attorney and his witnesses. The State is sending a message that the system can keep getting away with billing the taxpayers. They take away citizens’ due process trial rights, using rumor and hearsay as they have done to John. Katherine Hine, a member of John’s legal team, will join Lauren Tenney to discuss what really happens when the government-psychiatry partnership aims for lifetime lock ups of those it considers inconvenient. Casting a Wide Net: http://bit.ly/1leEtSv Legal protections corrupted: http://bit.ly/2aHglrS. Unlike what the corporate media tells you, the John Rohrer case is very typical -except for the vast amount of effort and legal talent put into freeing him. Spread the word to your Ohio contacts. Attend John’s hearing Tuesday August 9 and take notes. 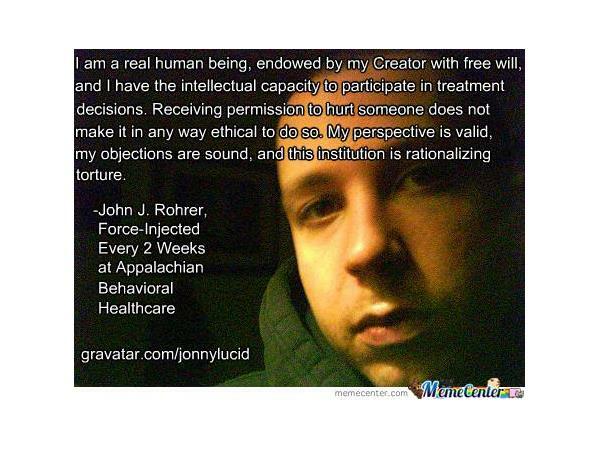 If John cannot be freed from the grip of government-psychiatry assaults – we can all easily become its prisoners. Help the cause of liberty. Help us make sure that resistance is not futile. With the presence of citizen court watchers in 2014, the Ohio judge stopped forced drugging John. Now it’s time to free him.